I recently updated my primary device to the Nokia N8 (from a HTC HD2) here is my review of the Nokia N8 after 1 week of use. To give you some background: I used to love Nokia devices about 2.5 years back when I was frustrated with almost all things Nokia (little or no device SW updates, lack of decent app store, basic software on phone is not provided) and decided to move away to the iPhone 2G, Blackberry Bold 9800 and finally to the HTC HD2 (which offered me ability to load custom Android ROMs from xda-developers). After my baby was born – I needed to have a great camera in my pocket all the time and have more media creation needs than ever before and Nokia N8 seems to be ‘the’ camera phone out in the market today. So, I made the switch back to Nokia again. Form factor: After using larger phones like the HD2 the N8 seems very small. It just reminded me of how big cell phones have gotten with the huge 4.3″ displays. I think the size of the device is right on with it’s 3.5″ screen. Speaker & Camera: It sits on the camera buldge and can easily get obstructed by your fingers or if sitting on a soft surface like a sofa couch. The volume is pretty good and I have no issue. On the camera the only gripe I have about this is there is no physical camera cover. Apart from that it’s awesome. Menu Button: Very odd location. And it seems to be meant for right handed operation. 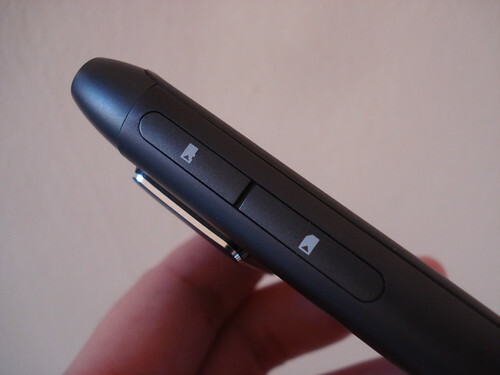 SIM/SD Slot: Obvious to locate – but not so easy to open & close. Display: Decent size and comparable to other popular display in pixels/sq in. However the 640*360 resolution somewhat feels constrained especially when browsing the web. It is awesome in sunlight (unlike most of my older devices including the iPhone). 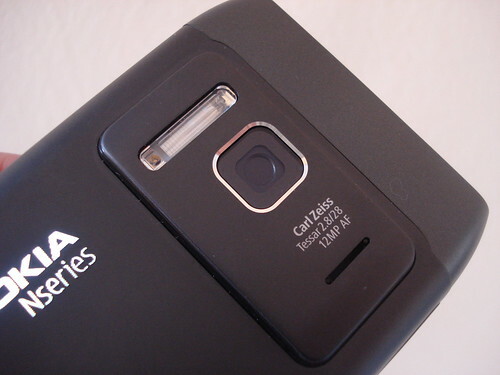 It uses hardened Gorilla Glass (like the Droid X) and I feel very comfortable throwing it in my pocket with keys & coins! Overall design: The aluminum construction and use of premium materials is awesome. Single handed operation is one of the big things Nokia has been notorious about having in a handset for and I am happy to say that nearly all functions of the device are operable with single hand – unlike most most modern touch screen phones. Connectivity: There are 2 highlight that I really like : It has Bluetooth 3.0 & Penta-Band 3G/WCDMA .. this is really awesome as it gives you access to 3G world wide irrespective which band the carrier uses. Symbian OS: Nothing really new here. It’s a solid OS and I personally feel at home using it. However, Nokia has done little to improve the user experience with the UI. I noticed a few places where you need to use the scrollbars! Web browser: The webkit based browser on older S60 devices used to be cutting edge technology until iPhone cameout. Nokia has failed to improve (some issue include : slow performance, not very intuitive, flash-lite only) on their browser and there is no excuse for it. Maemo5/N900 devices have a better browser and the least I would have expected is for Nokia to port the browser onto Symbian and include it in a Flagship product. Thumbs down on this one. Android devices today offer the best web browsing experience (with build in Flash 10.1 support). Apps (ovi) store: It works. But, it dosen’t have quite a few apps I usually need/use. Camera & Music player: They are awesome! Hands down the best. There are a lot of reviews on the internet on this one – I wont cover it here. AV Codec support: It takes anything you can throw at it. It probably the best in class out there. Corporate Email: The mail for exchange is very buggy. I cant compose, fwd or reply to my corporate EAS inbox. Widgets: Several of the built in live widgets are useless they dont really display usable information at a glance (this is what a live widget it supposed to do!). Nokia also missed out quite a few basic widgets like weather (You can get Accuweather widget from the ovi store). Multimedia service integration: Nokia’s share online software is missing! This is a big let down given that most people who view this as a ‘connected’ multimedia creation device would like to upload to various services directly from the device. There is a 3rd party app called Pixelpipe in the app store that does this job. But it’s no excuse for Nokia not to have this functionality built in on a multimedia creation device. UI: It’s pretty neat & plain – usually vanilla symbian interface. The underlying graphics hardware is ‘not’ being leveraged to its fullest for any usable & cool UI effect which is a let down. Battery life is surprisingly good with always on 3G. Over the air modular firmware updates work beautifully. I remember the days when you need to flash firmware from the PC. Good to see this has changed. Overall verdict: If you are a media creator and need the best camera in your phone, need to stay connected, occasional web browsing, great call quality – hands down this is the best device available today! There are some minor issues but nothing that cant be overcome with 3rd party apps, software update. If you really care about webbrowsing experience & large display and need a app for everything – you should look elsewhere aka android & iphone.